Dealing with DM: Walking into the Twilight | All Around Dogs Dealing with DM: Walking into the Twilight | Thoughts on training and life with dogs. 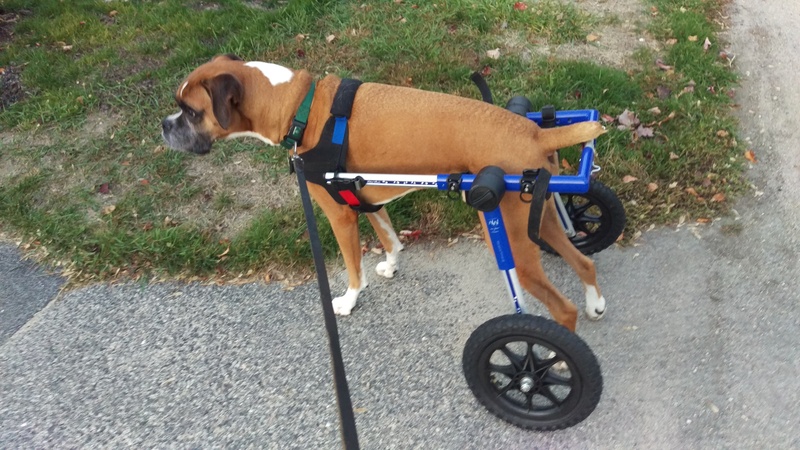 I thought of writing this post months ago, when Dash and I (and his wheelchair) took a peaceful walk at dusk. It was still summer, still warm, there was still light in the sky past 7pm. I thought of it, but I couldn’t quite make myself write it. And, as is so often the case, I had perfectly “reasonable” excuses to put off writing it. I was busy traveling for my job and moving. I didn’t have the right photo or I hadn’t fully composed my thoughts. But the simple truth is that this post is scary to write. 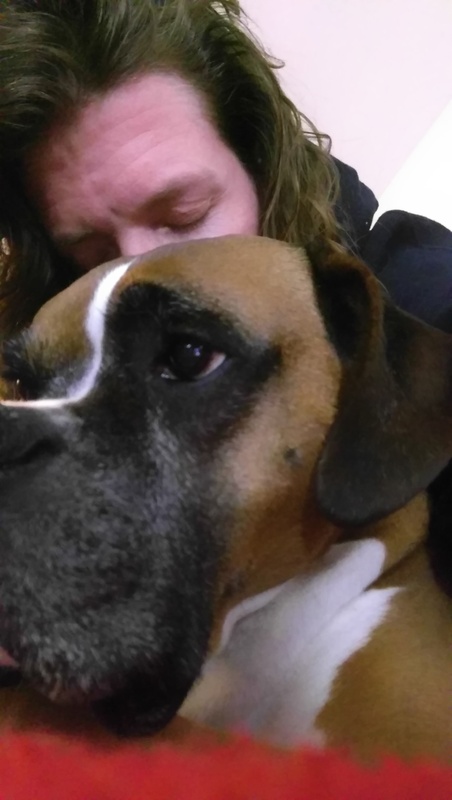 This post is admitting that I’m losing my boy. That our story ends… soon. I can be very logical and sometimes even come off as cold or dispassionate to people. Talking logically about the length of time I could expect to share with Dash, even going so far as telling people that I was discussing potential dates with my vet and my ex. Speaking about the stresses and frustrations that go along with his declining mobility. That is not a front or a show, I can look at something like this logically and analyze the likelihoods and complications. But that doesn’t mean my heart is breaking a little bit with each new marker of his decline. This post also means that there is an entire book still unwritten, flitting about in my head as snippets and anecdotes. A book that would have been enriched by writing it with him sitting along side me – with his presence in my life, giving me new ideas or reminding me of old ones. A book I couldn’t write because examining his life also meant confronting his death. A manuscript stuck drifting in neurons because I could not fathom how to accurately capture our journey, could not figure out how to possibly do it justice. I couldn’t bear to think that the last chapter in writing might very well be our last chapter together. Here are the simple facts about his condition: He is still walking, albeit drunkenly, on his own in the house but falls more frequently. He can mostly manage to get up on the couch but he flails and falls or, nearly unheard of in his prime, opts for a bed on the floor. When he was with the ex, he frequently rejected the rear-end harness and mostly stumbled about the yard unencumbered. When he’s with me, there are vinyl stairs and hardwood floors to contend with and he takes to the harness willingly. That flipped foot breaks my heart a little every time. A walk down our little dead-end street and back is enough to make him very tired, enough to make him ignore a nearby woman complimenting him as he focuses on the door he’s waiting for me to open. He mostly has control of his bladder and bowels, but not entirely. It is hard for me to comprehend. Last week, while the steady decline was apparent and he occasionally looked sad, the happy moments still shined brightly. He demanded snuggles and we spent hours in close contact. The fall winds seemed to egg him on like they always have and he had several rounds of harness-free play time in the yard with Delta – running, spinning, and giving chase despite his balance. But this description is coming from the man who pushed me to wait when I thought that mid-October would be the right time. The one who was hopeful that Dash might beat the odds and last longer than a year after his diagnosis. Someone who’s watched others take too long to make this decision. It is hard to imagine such a big change in one week but I know that he doesn’t say these things lightly. Years ago I wrote about putting your dog to sleep as an “unselfish” act. Making the arrangements with the ex before I’ve seen Dash for myself feels selfish. There is a glimmer of relief, feeling that this struggle might be over soon, followed quickly by a stab of guilt. He’s always been expressive, able to communicate with me so well. His face telegraphing his thoughts, his needs. He has a face that can say ‘Thank you’ when he’s grateful, ‘Momma, fix it’ when he thinks I have the solution to his problem. Tomorrow I will pick him up and bring him home with me. It may be the last time he makes that trip. I hope that he can tell me clearly that it should be – that this choice is right for him, not just us. Will you tell me ‘Momma, fix it’ for the last time?